If you held back from buying the Google Pixel 2, waiting for Verizon to drop the price just before the unveiling of the Pixel 3, we have some upsetting news for you. The nation's largest carrier has stopped selling the phone. It could be that Big Red is sold out, or just has decided to 86 the device from its lineup. The larger Google Pixel 2 XL is still being sold by Verizon. 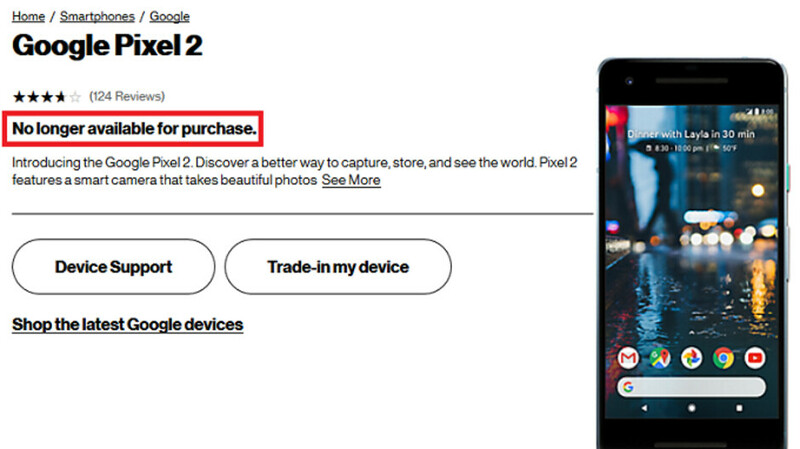 If you just have to have a Pixel 2, you can still find them for sale at the online Google Store, or at Best Buy. The 64GB model is priced at $649 or $27.04 a month for 24 months from Google. The 128GB variant is $749.99 or $31.21 a month over 24 months. At Best Buy, the monthly prices are a few pennies more per month. On October 9th, Google will hold its #madebygoogle event in New York City. We expect to see the unveiling of the Pixel 3 and Pixel 3 XL, with pre-orders for the pair being accepted immediately after the conclusion of the complete presentation. You can view the unveiling as it occurs by watching the Livestream on the #madebygoogle YouTube channel, or Instagram account. The event will kick off at 11am ET (8am PT, 15:00 GMT). I am so looking forward to cheap 2XL's being dumped on eBay. I’m with you on that. Been wanting to get a Pixel smartphone for a while now, as I’m a fan of stock Android, but I’ve been holding back due to too many bugs/issues. A 3rd generation Pixel is out of the question for me due to its horrendous design (looking at YOU, Pixel 3XL). I’m also not willlig to pay the huge price tag for what seems to be an ongoing beta project by Google, so cheap 2nd generation Pixels that will pop up on eBay after the launch of the 3rd generation Pixels are the best bet.